Content: There are some difficult situations with Merci’s grandfather and some intense moments and older themes. It’s in the middle grade section (grades 3-5), but it would probably be better for the older end of the spectrum. Merci Suarez likes her life: she lives with her parents and her older brother next door to her aunt and her twin sons on one side and her grandparents on the other. They’re happy as a family, with their traditions and squabbles, and she doesn’t want things to change. But, she’s started 6th grade, with all the pressure that brings, and her brother is a senior in high school and is going to be leaving for college. And, then her beloved grandpa starts forgetting things and acting strangely. And then there’s that girl (THAT girl) at school who Merci thought she was friends with, but turns out to be nothing but a thorn in Merci’s side. The question is: how is Merci going to deal with everything being different? This is a perfect little book about friendship and family and figuring out how to manage change. Merci isn’t perfect, which I appreciated, and I enjoyed the fact that the conflict came from something other than bad parents. Merci’s parents are supportive of her, and encourage her in her education. I felt for her at times, especially because she had to make sacrifices with friends and school because of her family. It’s a very realistic portrait, and one I appreciated. I liked how Medina captured the Latinx family experience; it’s a good example why Own Voices is so important. 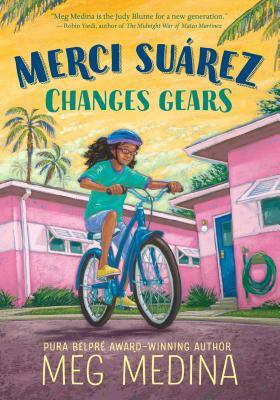 I liked Merci’s story, and felt for her experiences, and I loved how Media wove in culture and heritage as well.